This is a beautiful freeform has a slight pink hue. The energy is warm and strengthening. 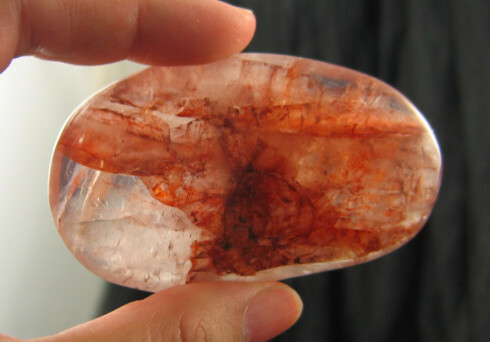 Inclusions of hematite give this natural crystal lovely patterns in hues of orange and red. Hematite included crystals which turn red are often called hematoid quartz. These hematoid quartz crystals are from Madagascar, another unusual find as they have not been polished. 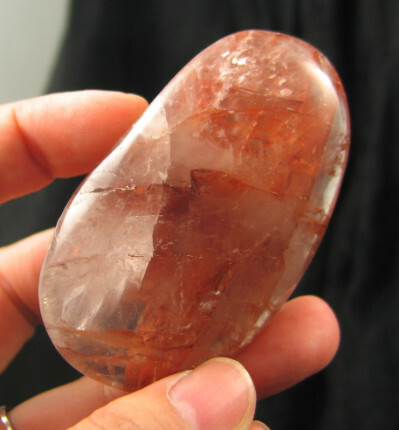 They are related to the papaya quartz crystals also found in Madagascar, but the inclusions are not as dense. 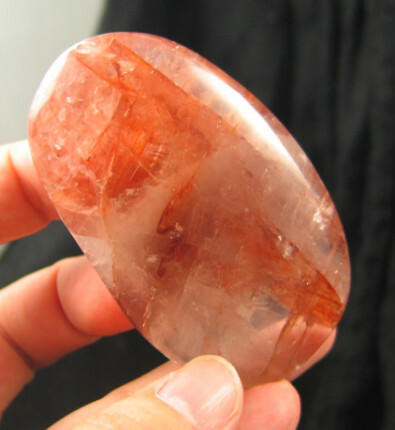 Their energy, which corresponds to the 2nd or sacral chakra, is not quite as intense as papaya quartz but just as rich. It works to energize the physical body and stabilize the emotions as well as heal old wounds. It will help to stimulate the entire energetic system and are used to lessen the degree of addiction, stabilizing an addictive personality. In addition, some of these crystals are singing crystals singing crystals too. The singing crystals resonate with a melodious sound when you tap or run your nail over the crystal. Singing crystals help to harmonize energy and banish negativity, raising your vibrational energy. Red Hematite energizes the etheric body and helps to give optimism, will and courage. It is a dynamic crystal. It produces an abundance of vitality, physical energy and Kundalini. Because it can repel and dissolve negativity, hematite is sometimes called the anti-stress stone. Hematite is also capable of helping the body remain cool, or of dispelling heat at the physical level; one could use it on the forehead to draw out the heat from a fever. It facilitates balancing of the yin-yang energies. Hematite can also be useful for focusing on past lives. Hematite is the common name for a wide array of iron oxides. Hematite itself has several varieties; the most common is hematite plates that form as a rose, and the massive botryoidal form which is usually polished into a wide array of shapes. Besides natural deposits of hematite, it can also be found included in dirt, clay or crystals, usually giving the material an orange to red coloration. Hematite is a supreme weapon against unionized radiation. It is recommended that you wear it in disk or pendant form against the skin when working on or around computers and such. It saturates your aura with an energy that repels radiation. You will find you have much more energy as a result. Hematite helps keep you grounded and in the here and now. It cleanses blood and is good for keeping you focused on difficult tasks.